Elinor is known for her outrageous dress, lively performances and humor as well as her creative skills. Yet she claims her greatest motivation is touching the hearts of creative and loving women. Elinor has been a creative consultant for Crafts Magazines, PJS Publications. She has designed fabric for Concord Fabrics, Daisy Kingdom and P&B Fabrics. She has written books on dolls, children's stories and five books for Bernina of America. 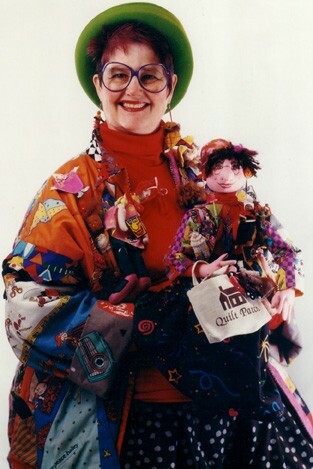 She founded APWPWD (Association of People Who Play with Dolls) and is a member of the United Federation of Doll Clubs and a friend of the National Institute of American Doll Artists. According to Elinor, dolls speak to people - particularly their makers - and that message is primarily to the inner person. Elinor is an experience not to be missed. Sat., 3/25, 9 a.m.- 4 p.m.